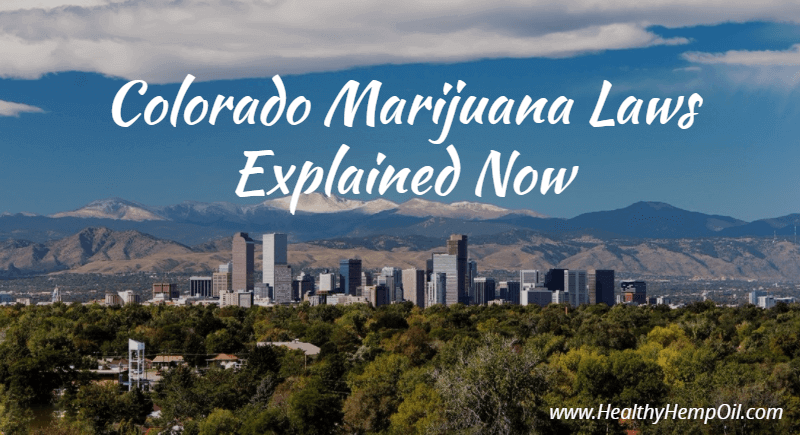 Colorado legalized marijuana use in November 2012 and allowed marijuana sales to the public on January 1st, 2014; however, marijuana law in the state of Colorado still comes with conditions. Whether you’re using marijuana for recreational or medical reasons or intend to sell it, it’s important to follow Colorado marijuana laws to avoid costly legal penalties and even jail time. In addition to knowing the law, you should understand the potential effects of marijuana so you can make an informed decision based on your personal health needs. We’ve put together this comprehensive guide to Colorado cannabis laws to help you navigate the legal landscape. Once you read this guide, you’ll know how to legally buy, sell, and use marijuana in the state, and you’ll understand what could get you in trouble. We’ll also provide you with science-based information on how using marijuana affects your health, including safe usage and consumption methods. Colorado made history in the U.S. by legalizing recreational marijuana use through a ballot measure known as Amendment 64, or the Colorado Marijuana Legalization Amendment. On November 6, 2012, after a majority of Colorado voters approved the measure, the state became one of the first two in the U.S. (alongside Washington) to allow adults over 21 to use marijuana without a medical prescription. The law took effect on December 10, 2012; it included a provision for marijuana to be taxed and sold commercially in Colorado starting on January 1st, 2014. Though recreational marijuana is legal in Colorado, that doesn’t mean that anyone can partake wherever they want. Much like alcohol, there are restrictions on legal marijuana in Colorado. Here’s what you need to know about buying, possessing, transporting, and using recreational marijuana under Colorado law. Age: You must be 21 or older to possess or use marijuana. Maximum amount: You can possess up to one ounce (1 oz.) of marijuana flower, concentrates, or edibles. Where you can use marijuana: You can’t legally use marijuana in public. That means no cannabis use in cars, bars, restaurants, parks, ski resorts, or even the store where you bought it. This restriction applies to all forms of marijuana consumption, including vaporizers and edibles. Essentially, you can only legally consume marijuana in a private residence, with some exceptions (see “marijuana-friendly places” below). If you’re in an apartment, you should check with your landlord. Where you DEFINITELY can’t use marijuana: Marijuana is prohibited in all of the national parks, forests, and other federally protected areas in Colorado. Even though it’s legal under state law, getting caught with marijuana in these areas can result in hefty fines and even imprisonment. And though this is probably obvious, you can’t use marijuana in — or transport to – neighboring states. Maybe your landlord isn’t ok with marijuana, or you’re just visiting the state. Whatever the reason, if you don’t have a private residence where you can use marijuana in Colorado, you still have options. There are plenty of private venues across the state that allow visitors to smoke, like special “lounges” that typically charge a membership fee or a daily rate for cannabis consumers. Occasionally, other venues will host pot-friendly events for the general public, usually with an additional ticket cost. And don’t forget the many hotels, lodges, and condos across Colorado that allow guests to use marijuana. Wherever you are, make sure to read up on your host’s policies and be courteous to others. What about growing my own marijuana? Though you can only travel with one ounce of marijuana or less, adults 21 and older are allowed to grow up to three immature plants and three mature plants. In this context, “mature” plants are those that can be harvested for usable marijuana (this stage is also known as “flowering”). You can keep all the marijuana these plants produce, even if it’s more than an ounce. If you do produce more than an ounce of marijuana with your own plants, however, it has to stay where you grew it. You can’t travel with it. We already covered the maximum amount of marijuana adults over 21 can carry on them (that’s one ounce, in case you need a refresher). But what about when you’re in the car? You can think of laws regarding driving with marijuana as similar to those related to driving and alcohol — consuming it while you drive (or as a passenger in a vehicle) is illegal and can get you a DUI (see “Penalties” under “Using Marijuana in Colorado” below). But unlike with alcohol, the law regarding “open containers” of marijuana in cars is tricky. That’s because marijuana is often stored in containers that you can open easily, like plastic bags. Even if a bag is closed and stowed away in the glove compartment, it could still be considered “open” by a police officer under certain circumstances. And driving with an open container of marijuana is illegal. Sounds confusing, right? Let’s break it down to make sure you understand what could get you in trouble if you’re driving and you’re pulled over with marijuana in Colorado. According to colorado.gov, you can be charged with a traffic offense if the marijuana product seal is broken, some of the product has been consumed, and there’s evidence that it was used in the car. Considering that this evidence is up to an officer’s discretion, the easiest way to ensure you don’t get a ticket for an open container of marijuana is to store it somewhere passengers won’t have access — like in the trunk. Otherwise, if the container of marijuana is still sealed, you shouldn’t have any problems. Can I get fired for using marijuana? Though marijuana is legal for adults in Colorado, your employer can still impose restrictions on drug use — even outside the workplace. Traces of marijuana can stay in your system for days or weeks, depending on how much you use and how often you use it. If your employer requires regular drug tests, that’s something to keep in mind. You may not find it at the corner store, but licensed marijuana dispensaries have sprung up all around the state — especially in big metropolitan areas like Denver and Aurora. Under Colorado marijuana laws, marijuana stores can operate from 8 A.M. until midnight, though it’s best to check with your local store as some cities (like Denver) require stores to close earlier than midnight. Keep in mind that the above rules only apply to what you can purchase, not what you can carry around. Whether you have flower, hash, edibles, or other concentrates, you’re allowed to possess one ounce of retail marijuana products. Aside from how much is in your possession, there’s no limit to how much marijuana you can buy in a day. Read more: What is Tetrahydrocannabinol (THC)? Form: Wax, hash, and edibles contain high doses of concentrated THC and will cost more than standard “flower” marijuana. Potency/strain: Products with more THC are more expensive (and have stronger effects). State and local taxes: See “Marijuana Taxes” below. The average pre-tax price of Colorado recreational marijuana in April 2017 was $6.95 per gram, according to an analysis by BDS Analytics. (1) That’s down nearly $2.04 per gram from the same period in 2014. But that’s only the average price for all strains of marijuana. You could expect to pay as much as $20 per gram or more for premium weed strains. Remember: There are 28 grams in an ounce, so buying the maximum legal amount of marijuana could be quite expensive, especially considering these are pre-tax prices. Several different taxes are applied to marijuana purchases in Colorado, including state and local taxes. Local taxes can vary from city to city. Denver, for example, charges a 7.15% tax rate for all recreational marijuana sales while Aurora charges 7.75%. In addition to the various local tax rates, a state tax rate of 15% is applied to all retail marijuana purchases. So, what do these taxes mean for you? In many Colorado cities, you can expect to pay at least 20% of the final purchase price in taxes for retail marijuana purchases. Where does all that tax revenue go? More than half of marijuana tax revenue funds K-12 education, including school construction, renovations, and bullying prevention programs. A significant portion (nearly a quarter by some estimates) goes to substance abuse programs and youth drug prevention efforts. A smaller percentage goes to law enforcement, such as the Marijuana Enforcement Division and the Attorney General’s special prosecutions unit. Possession: Those approved for medical marijuana can possess up to two ounces (2 oz.) of cannabis — double the amount allowed for recreational marijuana users. Products: Medical marijuana patients have access to higher potency edibles and non-psychoactive medications derived from cannabis, such as CBD supplements. Taxes: Unlike retail marijuana, medical marijuana is only subject to the standard 2.9% state sales tax and various local sales taxes; it’s not subject to extra taxes. Read on to learn how you can qualify for medical marijuana in Colorado, including how to apply for a medical marijuana card and medical Colorado marijuana laws for child patients. Patients may also qualify for medical marijuana if they display similar symptoms to those produced by these conditions. To become a medical marijuana patient, you must also receive a written certification from a physician licensed in Colorado. That certification must state that you have a qualifying condition and that you would benefit from medical marijuana. The process to apply for a medical marijuana card in Colorado is fairly simple and can be completed online (once you have written approval from a doctor). There’s a $15 processing fee for all applications. If you submit your online application with all the correct information, approval takes approximately 1-3 business days, according to the Colorado Department of Public Health & Environment. Apply for a Colorado medical marijuana card. Colorado allows people under the age of 21, including children, to access medical marijuana or products derived from marijuana, such as CBD. But there is one crucial difference for children. Children need a recommendation from two doctors instead of one to obtain medical marijuana. Children are more at risk for a number of conditions that might benefit from medical marijuana, such as epilepsy. But THC — the stuff in marijuana that gets you high — has been shown to have a particularly pronounced impact on adolescent brains (3). Therefore, your child’s doctor may recommend marijuana products that are low in THC but high in CBD — also known as cannabidiol. Read more: What is CBD (Cannabidiol)? Legal marijuana is one of the fastest growing industries in the U.S. today, and a lot of smart people are investing in marijuana. Want to become a part of that industry and open your own cannabis business in Colorado? Here’s what you need to know. Colorado has laid out a few requirements that prospective store owners must meet before they’re allowed a license to sell marijuana. Age: You must be 21 or older. No recent drug convictions or felonies: If you’ve been convicted of a crime involving controlled substances within the last 10 years or have had any felony convictions of any kind in the past 5 years, you’re not eligible to obtain a retail marijuana license. Residency: You have to have lived in Colorado for the past two years or be married to a Colorado resident. You’ll also need to verify that the city or county where you intend to do business allows retail marijuana stores within its jurisdiction. Some cities in Colorado, like Colorado Springs, only allow medical marijuana businesses. Colorado’s Marijuana Enforcement Division has listed the municipalities that say they’re open for business, though this list isn’t necessarily exhaustive. Be sure to check with your city or county before you start going through the application process. Unfortunately, opening a retail marijuana store or other cannabis business in Colorado isn’t cheap. These costs vary depending on what kind of operation you’re running (see “Types of marijuana businesses” below). Here are the costs you can expect for a standard retail marijuana store — just to get your business off the ground. Store costs: This is where it gets really expensive. Between acquiring equipment, buying real estate, paying your employees, setting up security systems, and other associated costs of starting a business, you’re probably looking at six or seven figures of expenses. One analysis of two Rhode Island medical marijuana businesses found their startup costs to be between $600,000 and $2,500,000. (5) Though your costs can be significantly lower with a tightly run retail marijuana store, you’ll certainly need plenty of funding to pull it off. For several years after legalization, Colorado required businesses to handle marijuana sales from seed to sale — that is, growing and cultivating the marijuana, harvesting it, and finally selling it. It was all handled under the same business umbrella. Now, marijuana producers don’t necessarily have to sell marijuana, and store owners don’t have to grow it themselves. There are even marijuana businesses that don’t sell or grow the stuff. Once you have your store opened and you’re ready to sell, make sure you’re familiar with the laws about purchasing marijuana in Colorado. If you sell over the legal limit to a buyer or sell to a minor, you’re liable for penalties under the law (See “Penalties” under “Using Marijuana in Colorado” below). You can find the maximum purchase limit for marijuana products above, but here they are again in case you missed them. Some mixture of the above as long as the total THC content doesn’t exceed the equivalent of one ounce. Here’s an example. Say you sold a buyer 4 grams of concentrate. After that, you could only sell them 14 grams of marijuana flower since the total THC equivalent of that transaction would be one ounce. Or, if you sold a customer 200 milligrams of THC edibles, you could also sell them 14 grams of marijuana and 2 grams of concentrates. As you can probably tell, you’ll need to understand math to abide by these purchasing rules. Make sure you and your employees can handle these calculations, or you risk running afoul of the law. Now that you know about Colorado marijuana laws, it’s time to cover what it’s actually like to use the stuff! In this section, we’ll cover methods of consuming marijuana, how to use it safely, its health effects, and what penalties you could incur for breaking the law. If you’re new to using marijuana, you might not realize that there are a number of different ways to consume it, each with its own advantages and drawbacks. Blunts/joints: Weed is rolled into a cigar or cigarette-like wrap and smoked. Pipes: Weed is loaded into “bowl” at the end of a dry pipe. Water pipes/bongs: Marijuana smoke is filtered through a chamber of water before reaching the mouthpiece. Smoking marijuana doesn’t require expensive equipment like some other methods (though you can definitely spend a lot on high-end pipes and bongs). But there are some drawbacks. For one, the smoke produced by burning marijuana can be harsh on the lungs. Depending on how you’re smoking it and how often, this smoke can have lasting effects on the respiratory system (more on that under “Health Effects” below). Another thing to keep in mind is that the high from smoking marijuana is different than a vaping high. That’s because the psychoactive THC released from combusting (burning) marijuana is different than what vaping releases. Many users report that smoking marijuana tends to give a longer-lasting, more “stoned” high as compared to the more mellowed-out feeling from vaporized cannabis. Marijuana vaporizers use electronic heating systems that get weed just hot enough to release the THC inside without combusting (burning) it. Taking a pull of vapor feels much smoother than taking a hit of smoke, and the vapor tends to have a softer and subtler flavor. Vaping marijuana has become quite popular in Colorado. So why are more people turning to vaporizers rather than pipes? Perhaps one of the reasons is the smell — or lack thereof. Unlike smoking marijuana, vaporizing tends to leave little residual odor. If you’re worried about your neighbors complaining about the smell of marijuana, don’t want your clothes to smell like weed, or are in a situation where you need to be discrete, a vaporizer is the way to go. The downside to vaping is that it can be expensive with a higher barrier to entry. There’s no such thing as a “disposable” marijuana vaporizer, unlike smoking blunts or joints. A small, portable vaporizer could go for about $50 to $60. Many of these products are called vape pens. On the high end, there are stationary “desktop” vapes, which produce a ton of vapor and could run you as much as $700. Dabbing involves heating up concentrated doses of marijuana on a small surface, usually a nail, and inhaling the smoke that’s produced. This concentrated cannabis goes by several names, such as wax, shatter, and butane hash oil. If smoking and vaping marijuana are like drinking a beer, “dabbing” a marijuana concentrate is like taking a shot of vodka. The high from this method tends to hit quickly and comes on strong. That’s because the THC extract is incredibly concentrated. Hash oils, wax, and other concentrates can contain 60-80% THC. Compare that to marijuana flower, which tends only to have 15-25% THC, and you can see why this method is so potent. Of course, a higher-potency product also comes at a higher cost. There’s also the fact that dabbing typically requires a blowtorch to heat the concentrate to the desired temperature, which can be dangerous if used incorrectly. One of the most popular methods with new cannabis consumers, edibles let you experience all the effects of being high without having to inhale smoke or vapor. Edibles can come in a variety of forms, including candies, sodas, and baked goods (like the stereotypical brownies). Though a lot of work has gone into making edibles safe for adults to consume, it’s important to understand what constitutes a “serving size” and how long they can take to kick in. Serving size: The recommended dosage for edibles is 10 milligrams of THC. That might be just one piece of a candy bar or a few sips of soda. Make sure you read the packaging label and understand how much you’re consuming. Duration: It could be a while before you start feeling the effects of edibles, depending on how full your stomach is, your metabolism, and other factors. You should wait several hours after consuming your dose before having any more. Some edibles can last up to 10 hours, so make sure you clear your calendar before you partake! If you have children or pets, be sure to store edibles somewhere they can’t get to them. The smell and flavor of edibles can be attractive, but consuming these products can be dangerous for young children and small animals. Also, remember never to drive or operate heavy machinery after consuming edibles. Though you might not “feel high” when you start driving, it’s impossible to know when an edible high will kick in and render you intoxicated. Lotions, salves, sprays, patches, and balms can be infused with cannabis to help treat skin inflammation, pain, itchiness, soreness, and other conditions. These products work by activating certain receptors in the skin with cannabinoids derived from marijuana, such as CBD topicals. Though they won’t get you high, topicals can bring relief to painful skin areas and even help with cramping and muscle soreness. It’s impossible to have a lethal overdose on marijuana (as far as we know). But that doesn’t mean you can’t get sick or seriously injured or die in an accident related to marijuana consumption. Here’s what you should know about using marijuana safely. Marijuana, edibles, and other cannabis products should be kept in airtight containers out of reach of children or pets. The law requires that marijuana products are sold in child-resistant containers. But it’s up to you to keep marijuana away from those who shouldn’t have it. To make your weed last the longest, you should store it in a cool, dry place with low or no exposure to outside air. Glass jars are great for this purpose. Marijuana itself won’t make you high if you consume it in plant form. You won’t experience any adverse symptoms, other than maybe some indigestion. But if you remove edibles from their original packaging, which has a prominent symbol warning that the product contains THC, you could accidentally consume a big dose of THC without even realizing it. If you’re noticing these symptoms in an adult, the best thing to do right away is to try and calm down the affected person, reminding them that what they’re experiencing is temporary and can likely be helped by reducing anxiety and taking deep, slow breaths. With children, however, it’s a different story. When toddlers or young kids ingest edibles, these symptoms can become serious. If your child has consumed a marijuana product, don’t be afraid to seek medical attention for their well-being. Likewise, you should call 911 if an adult is having trouble breathing, has pale skin, or is unresponsive. Different marijuana strains and products can have vastly different effects on the body and mind. It’s best to avoid mixing them until you’re fully aware of how they affect you and how much you can handle. Mixing marijuana and alcohol can make you severely impaired, often with feelings of nausea, dizziness, and drowsiness. Marijuana can also interact with prescription medications and other drugs with undesired effects. Make sure to look up whether marijuana can affect any medications you’re taking and vice versa. Like cigarettes, the secondhand smoke of marijuana can affect others in the vicinity, particularly in enclosed spaces with poor ventilation. It’s possible for bystanders to get a “contact high” from being in the presence of marijuana smokers. More research is needed to determine the effects of this secondhand smoke. You shouldn’t smoke around anyone who could suffer health consequences from inhaling it, like pregnant women, children, and those with respiratory issues. Addiction: The parts of the brain that manage impulse control and decision-making are still under construction in our teenage years — and those functions can be permanently altered for heavy marijuana users. Those brain changes can make it easier for youth to get addicted to marijuana, and those who start using it as a teenager are more likely to continue using later in life. Learning, memory, and potential: Marijuana affects short-term memory, attention span, learning, and decision-making abilities. These effects don’t stop after the high wears off. As the brain is still developing until your early-to-mid 20s, marijuana can create permanent changes in brain structure and function in teens. That’s particularly true for heavy users. One study on young heavy smokers showed a drop in brain functioning equivalent to losing 6 IQ points (4). Even though recreational marijuana is legal for adult use, you can still get in trouble with the law if you don’t follow the rules (see Possession and Use in Colorado above). Here are some of the fines, penalties, and criminal charges related to marijuana in the state of Colorado. Those with a valid medical marijuana card can possess up to 2 ounces of marijuana without penalty. Openly displaying or using 2 ounces of marijuana or less is a petty drug offense that can come with 24 hours of community service as well as a $100 fine. Possession of marijuana paraphernalia is a petty offense with a $100 fine. 4 – 12 ounces: A felony with up to 2 years in jail and a $1,000 to $100,000 fine. Possessing 8 ounces of marijuana or more is considered “intent to distribute” and will increase the sentence you face. All of these penalties are more severe when selling to a minor. All of these penalties are more severe when selling to a minor. Colorado law has established an impairment level for marijuana: 5 nanograms of THC per milliliter of blood. Since each person metabolizes THC differently, this level may or may not mean you are actually “high,” but you can still be charged with a DUI if your blood test comes back positive. Third and subsequent offense: Up to 1 year in jail, 120 hours of community service, court-ordered alcohol and drug driving safety education program and a $600 to $1,500 fine with 2 years of probation. Have any questions about anything in this guide? Let us know in the comments and we’ll do our best to answer them. This entry was posted in United States CBD Policy and tagged Colorado.